I’m exciting to be doing my first giveaway with Jon Messenger’s Fantasy novel Wind Warrior, generously provided by Clean Teen Publishing! This book was massively entertaining, so enter to win a free copy, then check out my review below! I received this book from Clean Teen Publishing in exchange for an honest review. I really enjoyed this book! Fast paced with lots of action and fantasy, and the promise for a great sequel! Jon Messenger’s writing is clean and crisp, making the book easy and enjoyable to read. The story was fairly simple, although there is a lot of promise for a complex conflict later on. Messenger doesn’t waste any time; you meet Xander, the main character and then BAM you head straight into the conflict. I had a little trouble connecting with Xander. I think perhaps it was because he’s a guy, and an unmotivated college student, two things I am not. I am a very motivated college student, not to mention a girl 🙂 Anyway, that being said, I LOVED Sammy, and connected much better with her character. She is part of a complicated family, and has to figure out what she believes is right, which was a nice little sub plot that I enjoyed quite a bit. I hope to get more insight into her character in the second book. 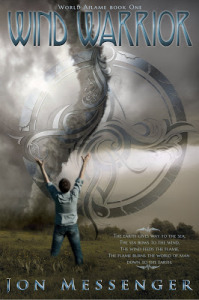 There is a long history of conflict between the Wind Caste (Wind Warriors) and the Fire Caste (Fire Warriors) that felt very High Fantasy to me; this book is set in our world though, in modern day, so it’s not written as High Fantasy. But you get to see a young man gain new powers, forced to learn how to use those powers out of necessity, and then rise to try to defeat a very powerful enemy. I’m really excited to see where this series goes because Wind Warrior was quite short, and I kept wanting to know more about the characters and what happened next. There’s a wealth of potential for this series, and as I read, I got the feeling that Messenger was a talented enough writer to really tap into that as the books progressed. I really hope he spends a little time fleshing out his characters in the next one, because he set a good foundation and the conflict is excellent. He has my attention. Secondary characters Sean and Jessica had a few chapters to themselves that were quite entertaining. I REALLY hope they join Xander as side-kick comic relief in the second book because they were very funny. I feel like they will add a nice layer of realness (not reality, no) to the story, because they are such ordinary people having to react to an extraordinary circumstance, and they react with humor (or, at least, they react in ways that are humorous to the reader). Always a positive. So I have high hopes for the second book. While I really enjoyed this book (hence the glowing review), it was not a book I felt compelled to read straight through in one sitting (hence the four stars rather than five). But I was highly entertained, and it was a pleasant, easy, well-crafted read. This entry was posted in Book Reviews, Fantasy and tagged Events, Fantasy, New Adult.